Fig. 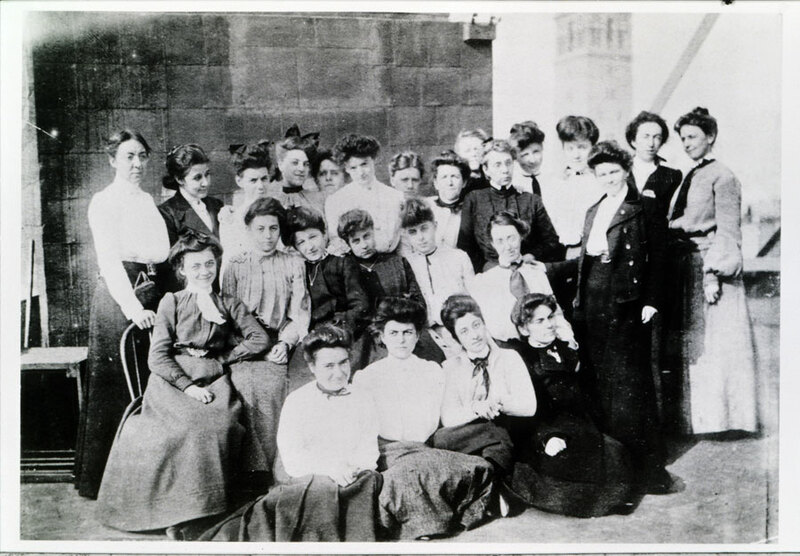 1: “Tiffany Girls” (Clara Driscoll at the far left) on the roof of Tiffany Studios, 1904–1905. The Charles Hosmer Morse Museum of American Art, Winter Park, FL. © The Charles Hosmer Morse Foundation, Inc. 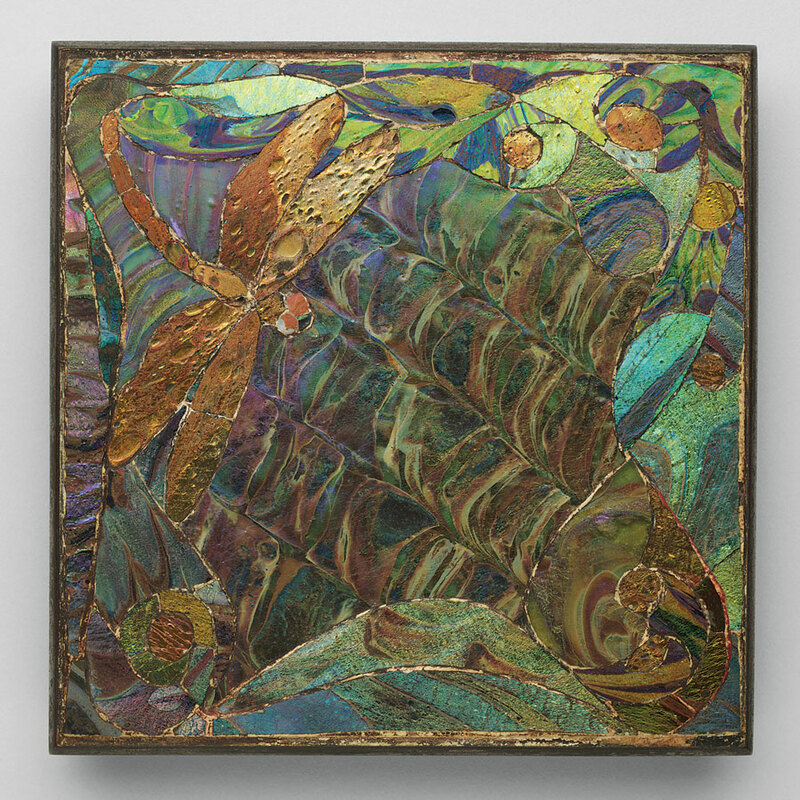 While Louis C. Tiffany (1848–1933) was the artistic genius behind the creative endeavors of Tiffany Studios, the discovery of a cache of correspondence written by Clara Driscoll (1861–1944), head of the Women’s Glass Cutting Department, has revealed the substantial contributions of the women who labored anonymously to create Tiffany’s masterpieces. Hundreds of letters preserved at the Queens Historical Society in Flushing, New York, and the Kent State University Library in Ohio identify Driscoll as the designer of many of the firm’s iconic lampshades. They also bring to light the instrumental role of the so-called “Tiffany Girls,” the young women who worked under her supervision selecting and cutting glass for windows, mosaics, and lampshades (Fig. 1). Born in 1861 in Tallmadge, Ohio, Clara Wolcott Driscoll was among the many young women who flocked to New York City in the late 1800s seeking respectable careers, particularly in the burgeoning field of industrial arts. After graduating from Cleveland’s Western Reserve School of Design for Women in 1882, she attended the Metropolitan Museum Art School in New York City and was hired by Tiffany around 1888. In 1892 she was appointed head of the newly-formed Women’s Glass Cutting Department, which eventually employed as many as thirty-five women. 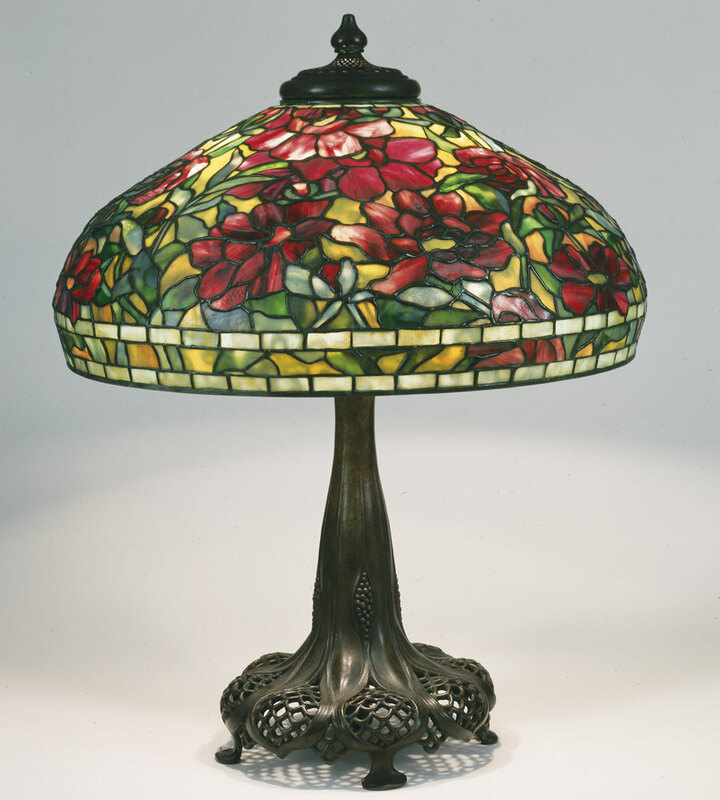 In addition to managing a large staff, Driscoll was responsible for creating designs for a wide range of objects and, in fact, designed most of the firm’s lampshades and mosaic bases. Little is known about Driscoll’s activities during her early years at Tiffany Studios, although she may have been involved in designing windows and developing designs into full-sized cartoons for the glass cutters. When Tiffany formed the Women’s Glass Cutting Department, hiring young women from art schools in response to a strike by the male-only Lead Glaziers and Glass Cutters Union, he placed Driscoll in charge. Women proved ideally suited to the work of glass selection and cutting. In 1894 Polly King, writing in the Art Interchange, noted: “In the field of pure ornament and pure color, for dexterity of handling and execution of detail, women are unsurpassed in this work, and really it seems rather strange that their adaptability to it was not noted long ago.”1 Initially assigned to work on windows and large-scale mosaics, the women’s work evolved to encompass and eventually focus on leaded shades and smaller fancy goods, often encrusted with glass mosaic. Fig. 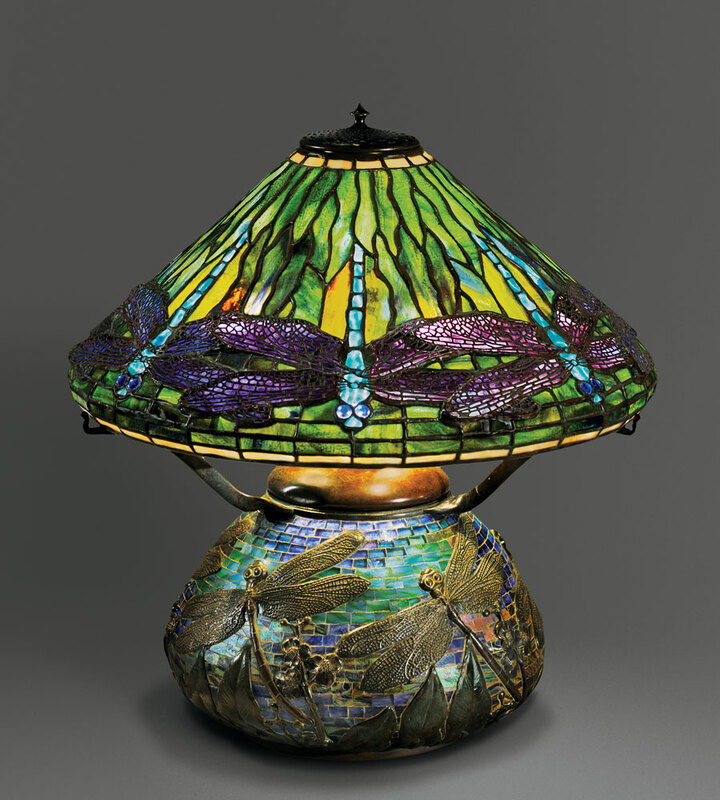 2: Dragonfly shade, designed by Clara Driscoll in 1899, model 1462. Diam. 17 in. Arrowhead base, designed by Clara Driscoll in 1899, model 145. Courtesy McClelland + Rachen, New York. Fig. 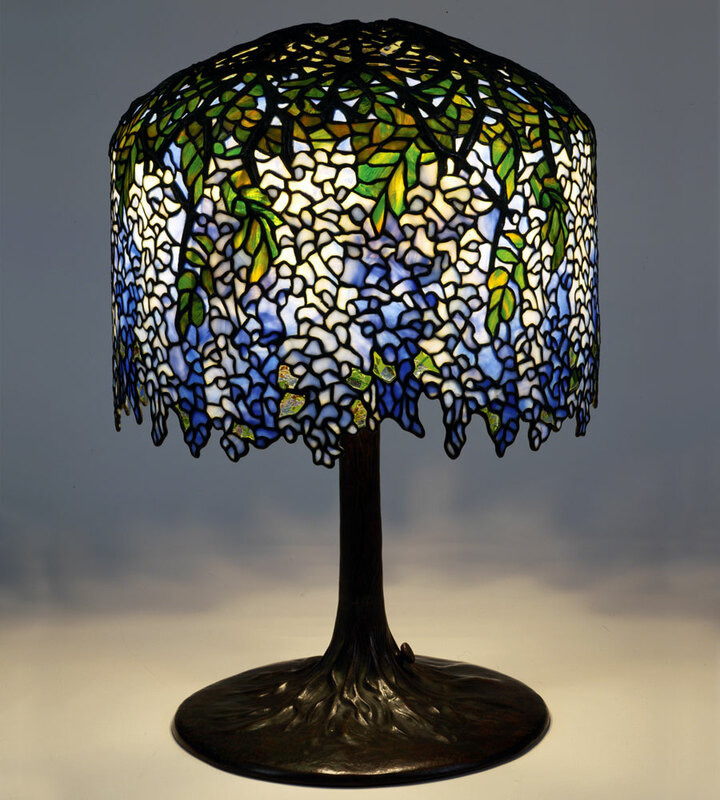 3: Wisteria lamp, designed by Clara Driscoll circa 1901, model 342. Diam. 18 in. The New-York Historical Society, gift of Dr. Egon Neustadt. Photography by Glenn Castellano. Fig. 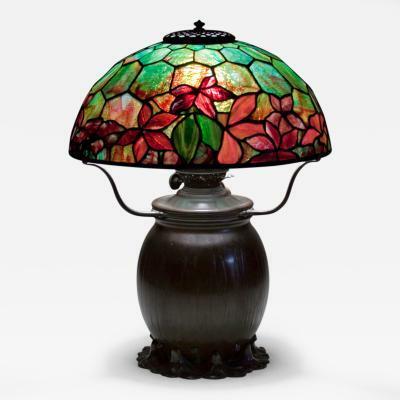 4: Peony shade, designed by Clara Driscoll circa 1900–1904, model 1505. Diam. : 22 in. Base designed pre-1906, model 397. The New-York Historical Society, gift of Dr. Egon Neustadt. Photography by Glenn Castellano. Fig. 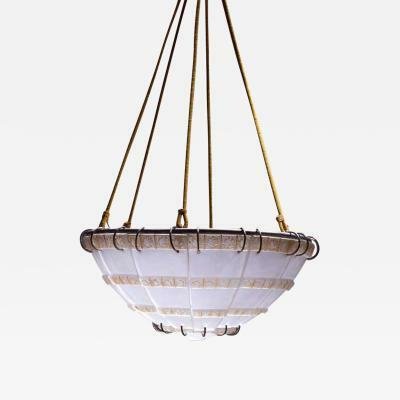 5: Arrowhead shade, designed by Clara Driscoll circa 1904, model 1496. Diam: 20 in. 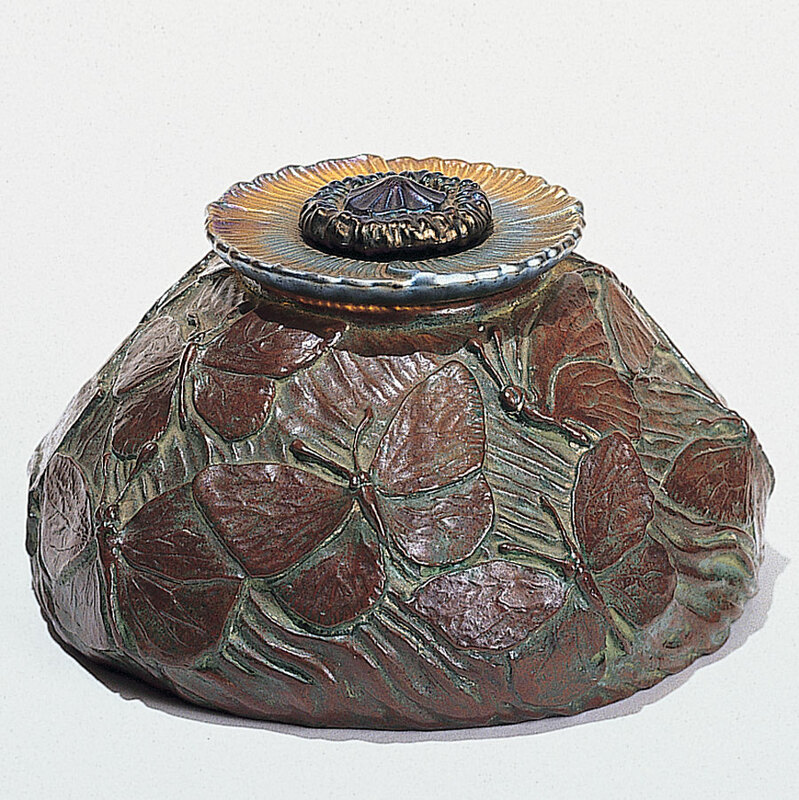 Cattail Pond Lily base, designed pre-1905, model 225. The New-York Historical Society, gift of Dr. Egon Neustadt. Photography by Glenn Castellano. Clara Driscoll’s correspondence provides detailed descriptions of the lampshade design process. 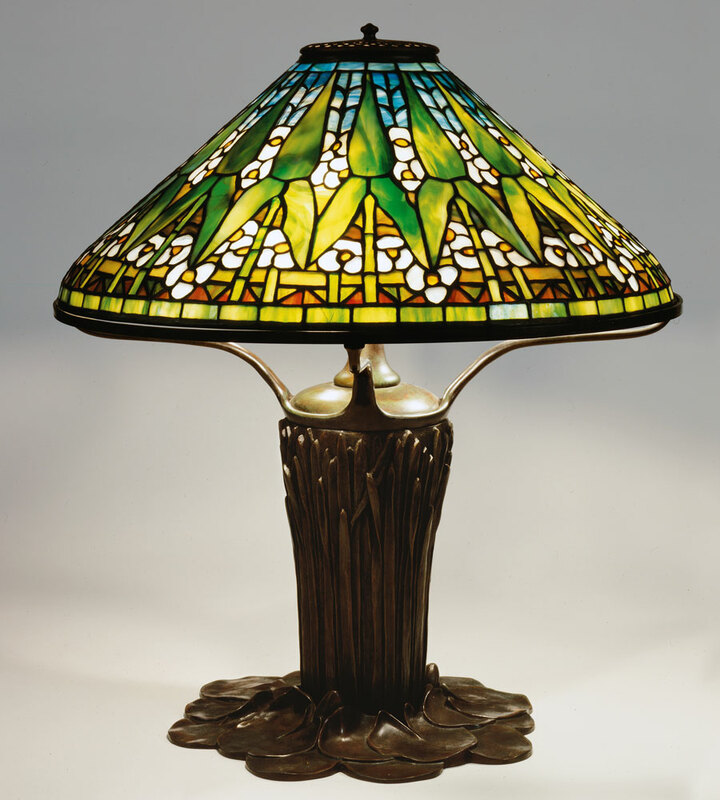 Though Tiffany himself encouraged her creativity, the Tiffany managers also pressured her continually to produce cost-efficient designs. Driscoll adopted an economical system in which multiple shades could be designed at one time on a single form. She described creating a plaster model of a fourteen-inch shade and dividing it into three parts in order to create three models of the same shape: Arrowhead, Geranium, and Daffodil.8 Although these models do not seem to have been produced in great numbers, larger versions, such as the twenty-inch Arrowhead shade (Fig. 5), survive in quantity. Fig. 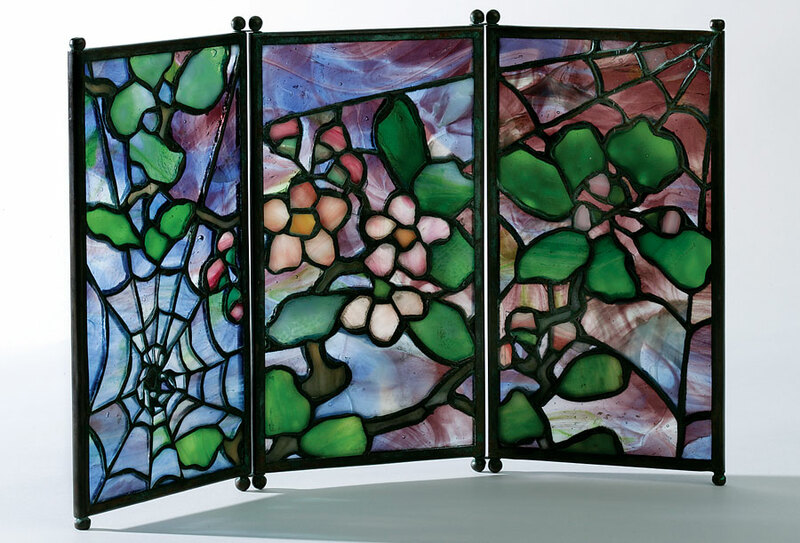 6: Tea screen with apple blossoms and cobwebs, probably designed by Clara Driscoll pre-1906. Bronze and glass. H. 7-1/2, W. 12-1/2 in. Private collection. Courtesy of Lillian Nassau LLC, NY. Photography by Glenn Castellano. Fig. 7: Carp and dragonfly tea stand, probably designed by Clara Driscoll circa 1900–1902. Bronze and glass. H. 6-1/4, W. 6-1/4 in. The Museum of Modern Art, New York, gift of Joseph H. Heil. Fig. 8: Butterfly inkstand, probably designed by Clara Driscoll pre-1906. Bronze and glass. H. 2-1/2, W. 5 in. Private collection. Photograph by Glenn Castellano. Beyond lampshades and bases, Driscoll also designed desk accessories, candlesticks, jardinières, and similar objects marketed under the general term of “fancy goods,” although she referred to them in her letters as “novelty items.” Tea screens—intended to protect the spirit burner under a teakettle—evolved from Driscoll’s work with leaded-glass windows. One tea screen (Fig. 6) incorporating apple blossoms and cobwebs is reminiscent of the Cobweb shade she designed prior to 1902. Trivets or “tea stands,” as they were called by the company, were another way of coupling the beautiful and the useful, qualities prized in that era. A richly textured Cypriote glass example features both a fish and a dragonfly (Fig. 7), two motifs that appeared in Driscoll’s early lamps. Swarming butterflies on a bronze inkstand (Fig. 8) recall her Butterfly lamp of 1898. 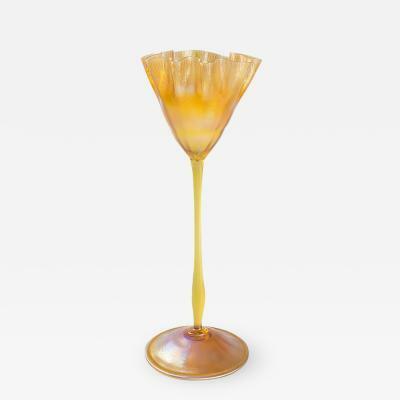 Clara Driscoll left Tiffany Studios around 1909 because of her impending marriage—company policy dictated that married women could not work there. She subsequently built a modest career painting silk scarves, but never again achieved the creative and managerial accomplishments of her years with Tiffany. By the time of her death in 1944, her remarkable achievements at Tiffany Studios were long forgotten. Driscoll’s work was the subject of a book, A New Light on Tiffany: Clara Driscoll and the Tiffany Girls, and exhibition at the New-York Historical Society. For information visit www.nyhistory.org. Margaret K. Hofer is curator of decorative arts at the New-York Historical Society; Nina Gray is an independent curator and scholar; Martin Eidelberg is Professor Emeritus of Art History at Rutgers University. This article was originally published in the Spring 2007 issue of Antiques & Fine Art magazine, which is associated with Incollect.com. The entire digitized issue is available on www.afamag.com. Since publication, coauthor Nina Gray passed in May 2013. 1. Polly King, "Women Workers in Glass at the Tiffany Studios," The Art Interchange 32 (October 1894): 87. 2. In one rare instance, a prize-winning lamp she designed was noted in a newspaper article. See "Women Who Make $10,000 a Year or More," New York Daily News, April 17, 1904. 3. July 19, 1898, and April 6, 1899, Queens Historical Society (hereafter QHS). 4. April 6, 1899, QHS. 5. "Women Who Make $10,000 a Year or More," New York Daily News, April 17, 1904. 6. February 12, 1902, Kent State University Library (hereafter KSU). 7. February 15, 1906, KSU. 8. October 14, 1904, KSU.